Summer Day Camp provides a safe and engaging learning environment where students can learn about the gospel, participate in exciting activities, and visit places outside of school grounds. Below are some testimonials about our camp from staff and volunteers. "To me, summer camp means an opportunity. It is an opportunity to be inspired and to personally know God. It gives you an experience in which you are not only learning about Him, but learning about yourself. However, when participating in day camp, you are also able to pass this opportunity on to the kids. They too have the opportunity of learning the wonderful gospel and growing in Christ alone! That is why I believe that day camp is extremely important for the kids. They are blessed with an opportunity to follow God and it's amazing to know that we, as staff, have contributed to that." "Summer camp was a time for me to make and grow in my relationship with the kids and the staff. It was also a reminder for me about how much Christ means in our lives. It is really important for the kids to be in day camp because it surrounds them with the messages of Christ. Although it is also important for them to have fun, we are hopeless without God." "Camp for me was a way to spread the worship for god to them and even for the kids because camp is a place where they can hear the gospel and be encouraged." "For me, the Summer camp was a time where I could spend time with the kids, and be able to serve a different community other than the ones we are more comfortable with. I believe the day camp is important for the kids because it gives them a time to learn and look to God more than just once a week." "To me, the summer camp meant glorifying God by being a blessing to the children. I think it is important for the kids to be in day camp so that they are brought to Christ centered environments, particularly if they are not exposed to God at home!" "LOGAN Hope Day Camp has given me the opportunities to explore and expand my faith in God. Just seeing the kids smile and grow little by little in Christ makes all our efforts worth it"
"Day Camp rooted my faith in Christ. 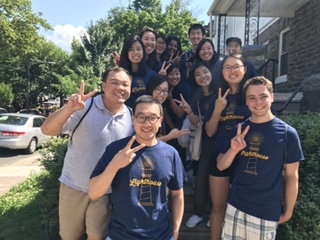 Without the help of the many influential staff working there, I would not have volunteered to help or have understood how great God's love was"
"Personally, I see the LOGAN Hope school as a symbol of God's UNFAILING LOVE and INFINITE HOPE for the families in the community of Logan, Philadelphia. It is a peaceful sanctuary with teachers and staff that not only teach the students but also love and support the students and encourage them toward a relationship with Jesus that would sustain them throughout life. The summer day camp is an integral piece of this ministry of the school. Aside from having just pure fun and providing activities for the kids during the summer break, it is a time for the kids to continue to explore who Jesus really is in a fun and laid back atmosphere. The summer day camp provides the young students opportunities to learn more about the love of God and even show it to one another and especially those who would not regularly attend the school throughout the year. It has been precious to see students make friends with, care for and love other kids who don't attend the school and welcome them into their school family. Many of the kids have been truly touched by the love of Christ shown by other students, staff, alumni and volunteers and it has allowed even the smallest of kids to know that there is hope because of Christ even in tough situations. Another invaluable part of the summer day camp has been the opportunity to continue to minister to the older students and alumni of the school. It has been naturally difficult for the school to maintain support for those that graduate the school. However, recruiting the older students and alumni from LOGAN Hope to assist and lead the summer camp has provided a way to continue in ministering and holistically building up these students. It has given them a chance to have and learn responsibility and leadership. It is essentially a summer job for these older students where they plan and prepare the activities and decorations for the camp, and learn to lead and teach the younger kids. I view this summer day camp as a really important part of the ministry of building up and encouraging the students and even volunteers to be humble servants. 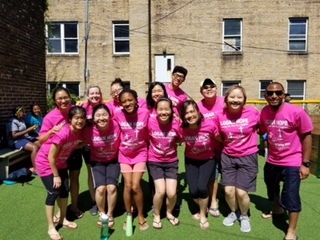 On behalf of Grace Covenant Church in Philadelphia, I deeply thank the LOGAN Hope School staff and community for inviting us to partner for the Gospel of Jesus Christ during the summer day camp for a second summer. It has been a wonderfully fulfilling experience to love and serve the kids, alumni and staff of LOGAN Hope during these past two summers and even throughout the school year. Through this experience and interactions with the kids, alumni and staff of the summer camp, every team member has been personally challenged and has deepened their relationship with Jesus. We have been able to witness the thick presence of God, the deep Love of Jesus Christ and the evident work of the Holy Spirit in the LOGAN Hope School. Our teams have been humbled and honored to be able to build God's kingdom through assisting the summer day camp, but we too have been touched and deeply changed by this loving LOGAN Hope family and by our Father in Heaven. We look forward to continuing an encouraging and edifying relationship together." "LOGAN Hope Summer Day camp means so much to me. I got to witness and experience more of the Father's heart for his children through this camp. It it so clear that God is moving powerfully in the hearts of the children. Without day camp, many of the children would not be involved in anything for much of the summer since their parents are working/busy, so it is important for the kids to come together not only to play and fellowship together, but also to learn more about Christ."